Carey Charboneau’s client just knew she wanted something different. Looking at the prints for her new home, Carey, a designer for Kalamazoo Custom Kitchens and Baths, realized that she basically had a bungalow style house. 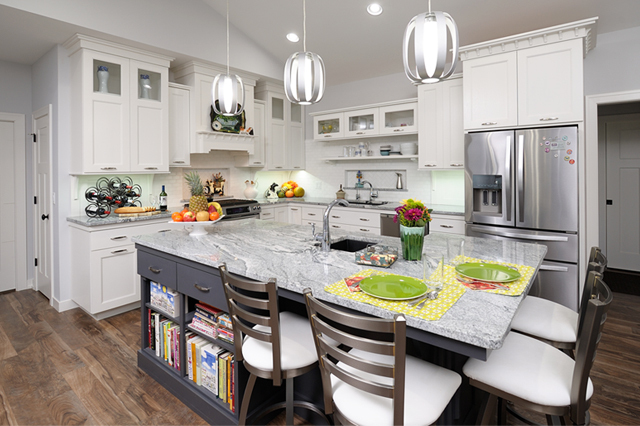 So he set out to work that style into her kitchen, only with some contemporary twists and client-centered customizations he knew Grabill could do. His client, single and a widow who liked to cook and to entertain family members and members of the community she was actively involved in, first of all needed an island with some seating capacity and some “hanging around” space where she could prep food and talk to her guests and even handily accommodate a second cook. 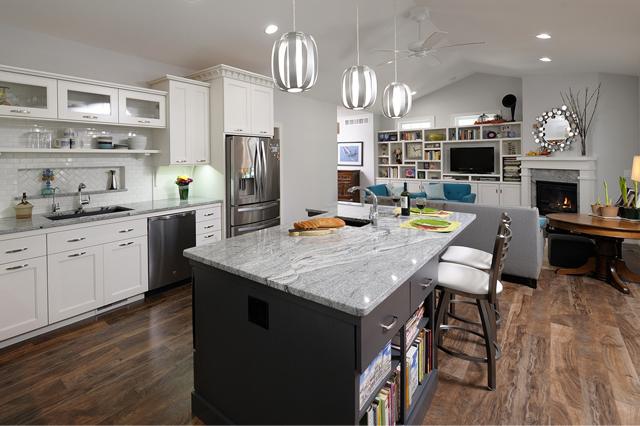 Along with a seating perimeter, the island was customized with different–sized cabinets, shelving, drawers, a trash compactor and a built-in space for a specific-sized microwave. Most stunning, though, was the color — what Carey called a grayish blue from Grabill’s new custom gray collection (Grabill custom ). For the perimeter cabinetry, Carey brought in the bungalow look most prominently with the cabinetry design and positioning above the stovetop counter, including heavy crown molding and a string of custom designed corbels anchoring a mantle on the range hood. 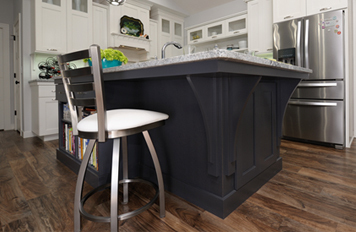 The cabinet style itself, as with the island, is a transitional Hampshire FO with a mortise and tenon construction for a framed, full overlay. 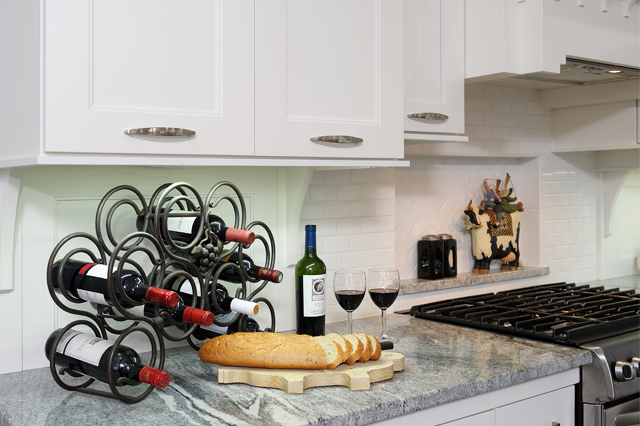 This style, along with contemporary hardware, provides a clean, modern feel as well. The bright finish for this and the other perimeter cabinets is another custom paint color (#P8863) from one of Grabill’s many whites. On the sink side of the kitchen, intricate, corbelled molding crowns the cabinet on top of the refrigerator, but then a contemporary look also comes into play with the horizontal lines of the small pull-up door cabinets and long open shelf beneath them. 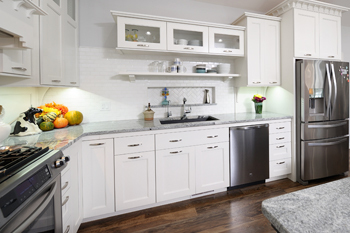 Further adding to the clean but quaint look of the place is the backsplash covered in shiny subway tile. The client didn’t want the flow (or the glow) of the backsplash interrupted, so, with one exception, the needed electrical outlets were innovatively placed in 2 1/2-inch false bottoms with the three longer wall cabinets, so appliances plug into those cabinet bottoms. Looking to keep costs down, Carey will order from the Grabill catalog when he can, but he sure appreciates Grabill’s custom capabilities — for things like the island (which also sports custom corbels), a custom lip molding applied to the top front edge of the base cabinets to raise the counter a bit for a taller than average woman, different size drawers in the same stack, and all the other little touches that brought this distinctive collection of kitchen parts together. Grabill’s versatility and vast spectrum of options made it easy for Carey to get the just-right fit for his client. All in all, this “updated bungalow” style proved to be just the kind of difference the client ordered.